The 2015 Honda Civic Type R has been revealed at a press conference at the Frankfurt auto show and the big news is it is a turbocharged car now. Manabu Nishimae, President, Honda Motor Europe overviewed the European car saying that the new 2.0 liter, direct injected turbocharged engine would develop in the neighborhood of 275 horsepower. This is a huge leap up from the Civic SI marketed currently in the United States. If it were to come to the United States it would also mark the first time that Honda has used a turbocharged engine in the hot Civic. All enthusiasts know that model has always been characterized by a high revving normally aspirated four cylinder engine. That is until the current car which now used the 2.4 liter base Accord engine. Although a good engine with better low range torque than previous SI engines, the 2.4 is not the screaming F1 style motor that fans have always loved. If Honda were to offer the Type R, or a variant in the US, it would again be competitive with the MazdaSpeed 3, Mitsubishi EVO and the Subaru WRX, which in recent years have simply upped the ante in the hot hatch segment. It may also be a fair fight in a matchup with the Ford Focus ST, which coincidentally has a 2.0 liter turbocharged engine capable of about 250 HP. 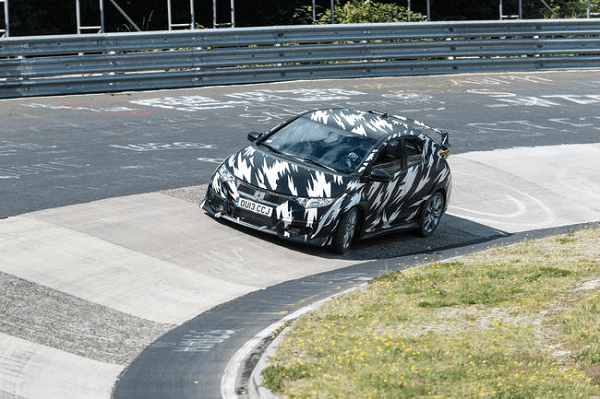 As an interesting side note, Honda UK is making a lot of noise about the Civic Type R being one of the fastest ever front wheel drive cars around Germany’s most famous, and most bankrupt toll road, the Nurburgring circuit. To prove the point and to provide some enjoyment for fans Honda has provided the video below as evidence. In his comments Mr. Nishimae said "We have recently spent a week at the Nurburgring, carrying out extensive testing and we are on target, and have already set a time approaching the lap record." According to Honda the car has some more development work to complete and is not slated for introduction just yet. Look for the car to be a true 2015 model with sales starting in European markets in about 2 years.